Who doesn't LOVE Chocolate Fudge Brownies? This recipe is so easy, even the kids can make them!! Preheat oven to 180°C (350°F). Grease and line a slice tray. Melt butter in a pan, and stir in the unsweetened cocoa powder. Set aside to cool. Beat together the eggs, sugar and vanilla extract in a bowl, then stir in the cooled cocoa mixture with the nuts. Sift over the self-raising flour and fold into the mixture with a metal spoon. Pour the mixture into the cake tin and bake in the oven for 30 to 35 minutes, or until risen. Remove from the oven (the mixture will still be soft and wet, but it will firm up while cooling). Cool in the tin. To make the frosting, melt the chocolate and butter together in a pan and remove from the heat. Beat in the sour cream until smooth and glossy. Leave to cool slightly, and then spread over the top of the brownies. 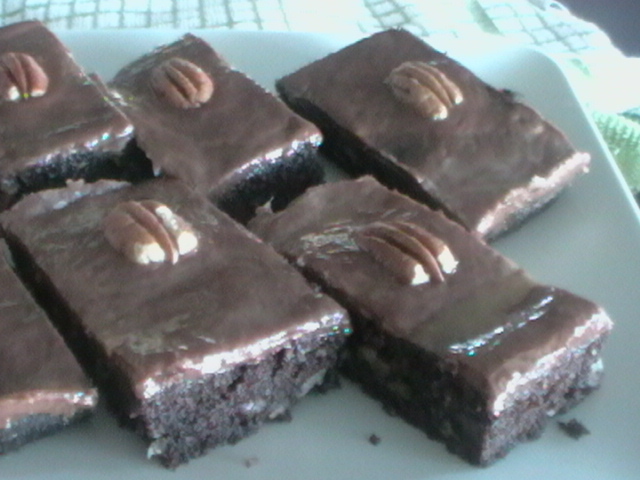 Place one pecan nut half in the centre of each brownie. When set, cut into 12 pieces. Viola!! You're going to LOVE these! !